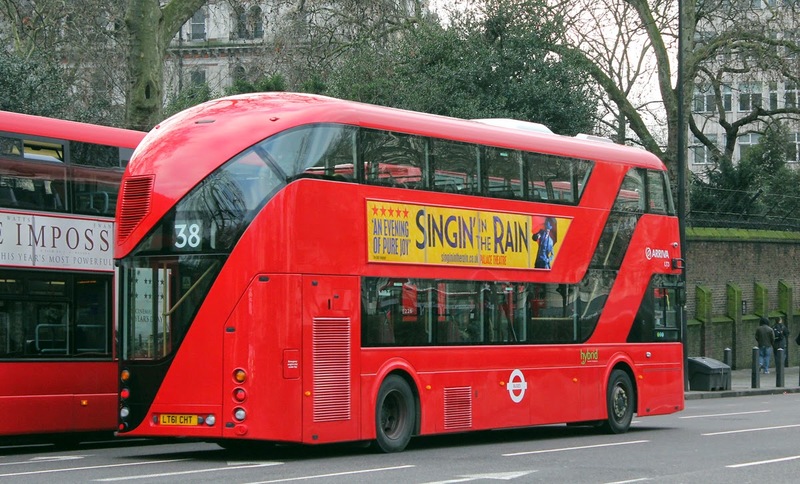 It is now over two years since the New Bus for London (NBfL) was introduced to the travelling public. Built by Wrightbus this 11.3m long hybrid has now graced the streets since the first entry into service on 27th February 2012. 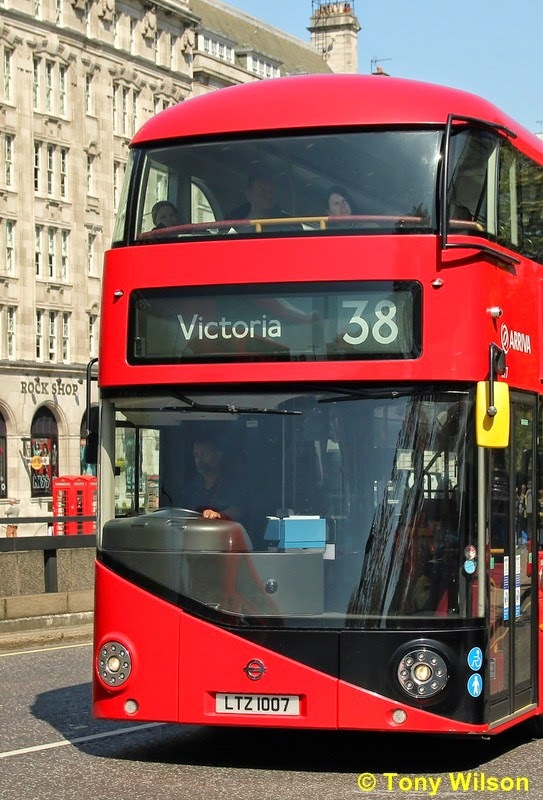 Eight of the type were acquired by Transport for London (TfL), and assigned to route 38 operated by Arriva London. Normally the route runs from Victoria Station to Clapton Pond, but these buses initially supplemented the normal service but only as far as Hackney Central. 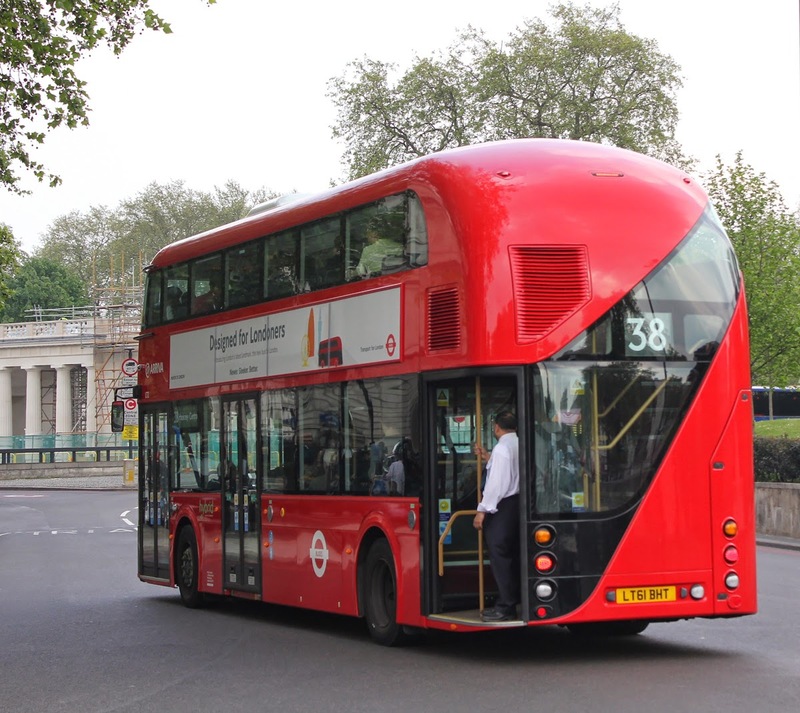 Dubbed the 'Borismaster' owing to London Mayor Boris Johnson's enthusiastic promotion of the vehicle, it has since gained the name 'New Routemaster' and has now around 200 examples of the proposed 600 production models in service. They have also been assigned the class letters LT, which along with the Northern Ireland registration marks LTZ 1004 upwards identify each vehicle. Apart that is from LT 1-3 and 8 that started with and retain English LT61 year registration plates. These innovative vehicles look distinctly different to anything seen before in London, and all for the time being feature three doors front, middle and at the back. The rearmost door can be operated in either closed or open mode and depends upon the type of operation crew or one-person and also upon the time of day. As a general rule crew (driver plus Customer Assistant), operates during Monday to Friday daytime, sometimes Saturday daytime, but one-person-operated at other times. All doors remain closed during travel when driver-only. 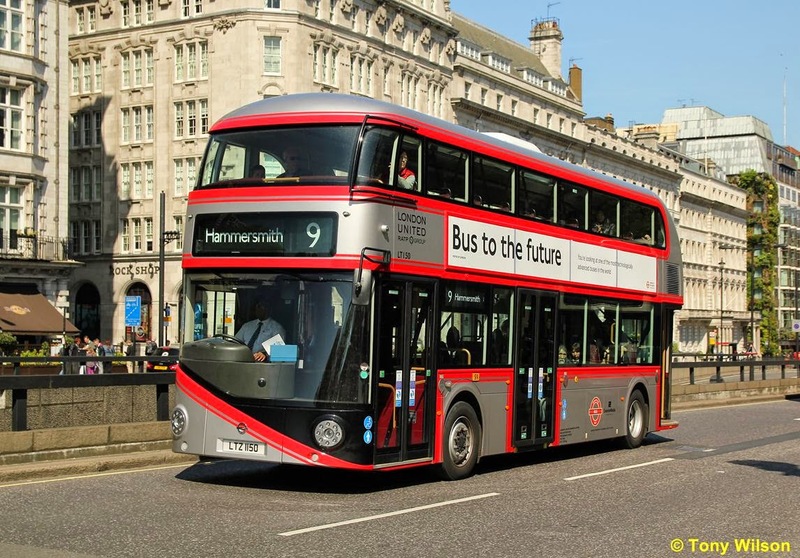 The fleet are all owned by TfL and assigned to companies dependent upon who operates the respective contracted routes within the London bus route network. 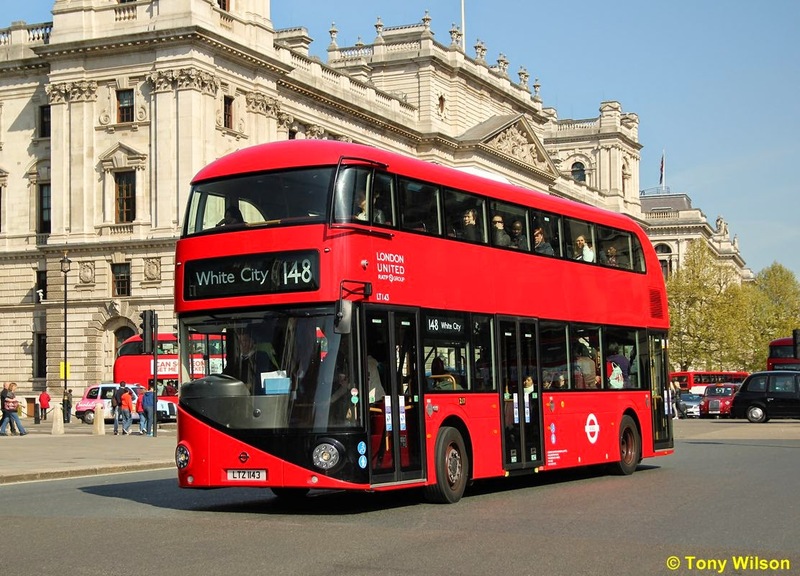 The first route to gain a full complement of the type was the 24 (Hampstead Heath & Pimlico), from the 22nd June 2013 with LT 9-40 operated by the Holloway Garage of Metroline. 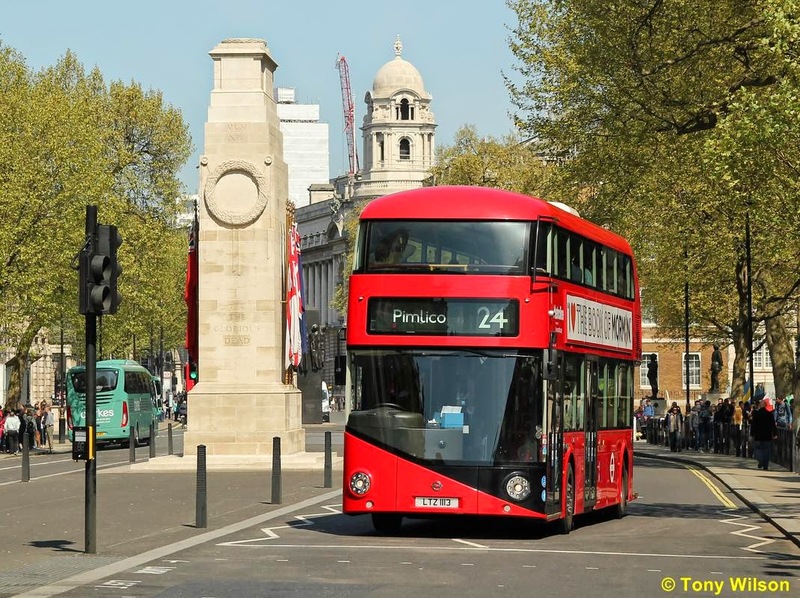 Metroline's LT 113 from their second batch for route 390 passes The Cenotaph as it glides down Whitehall on the 24. Next up was route 11 (Fulham Broadway & Liverpool Street Station), this time operated by London General from their Stockwell Garage. LT 41-68, 118 and 119 were allocated. 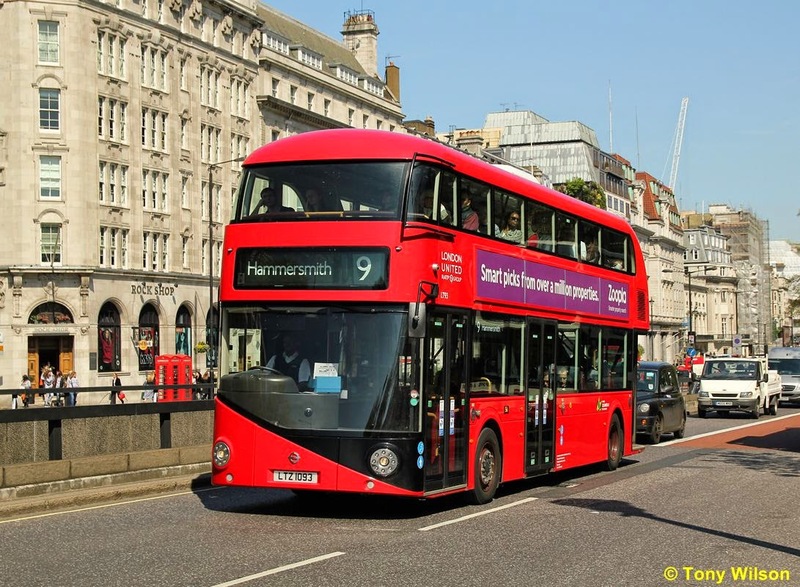 The on the 26th October 2013 route 9 (Aldwych & Hammersmith), succumbed to the type with LT 69-94 allocated to the Stamford Brook Garage of London United. 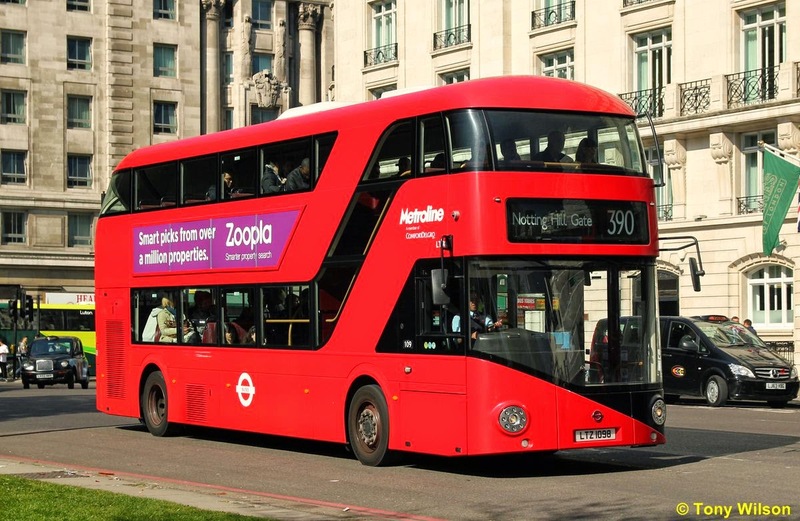 The last route converted to the type in 2013 was the 390 (Notting Hill Gate & Archway Station), on the 7th December. Also run by Metroline, this time with LT 95-117 allocated and again operated out of their Holloway Garage. 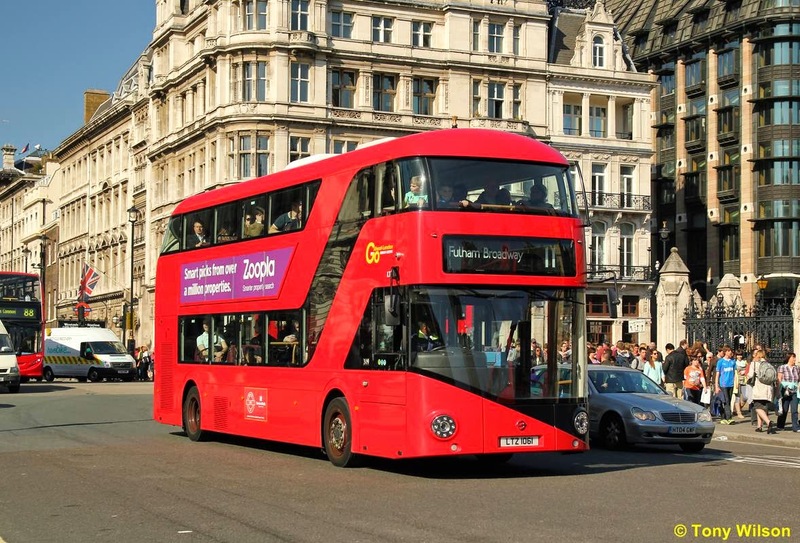 Into 2014 and so far two more routes have gained the type both operated by London United. In date order the 148 (Camberwell Green & White City), with LT 120-147 on the 15th February and LT 148-171, 174 and 175 for the 10 (Hammersmith & St.Pancras Station) on the 26th April. Currently there is one NBfL which operates in non-standard TfL red livery. LT 150 run by London United is in a rather splendid silver with red livery and promotes the bus design through the TfL "Year of the Bus". Silver liveried LT 150 glides west along Piccadilly as it approaches Hyde Park Corner when on the route 9 to Hammersmith. 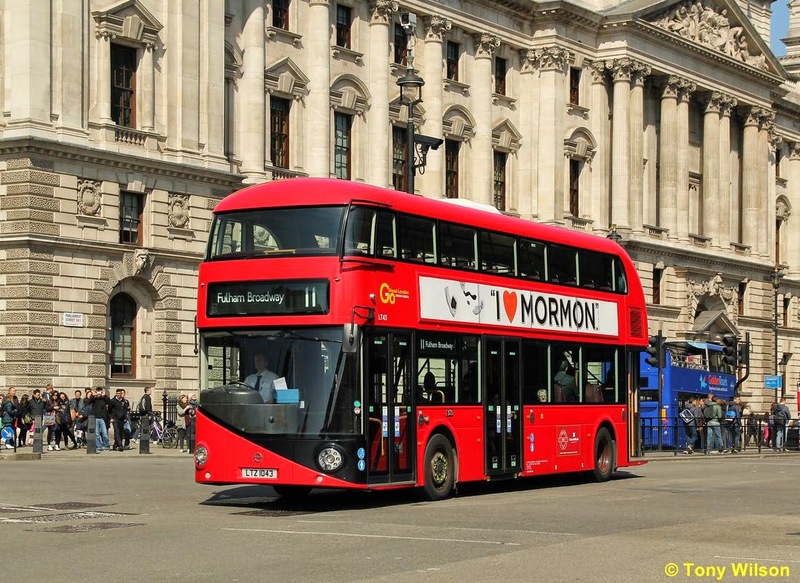 It certainly stands out from almost all other buses in London at the moment, with several more LTs due to enter service in the livery during the year. There is one other silver liveried bus in stage service at the moment, an original traditional Routemaster RM 1650, which displays the fleet number SRM 3. Operated by Tower Transit it is used on one of two 'heritage' routes that run through central London and meet up in Trafalgar Square. These are the 9 to Kensington operated by Tower Transit and the 15 to the Tower of London run by Stagecoach. Regrettably the 'real' Routemaster 'heritage' 9 service is due to be withdrawn from the 26th July. It has been announced and confirmed that further routes due to have phased conversions are the 38 (Clapton Pond & Victoria Station - the 'Customer Assistants' will only crew the buses between Mildmay Park & Victoria) and the N38 (Walthamstow & Victoria Station) on the 10th May, both operated by Arriva London. 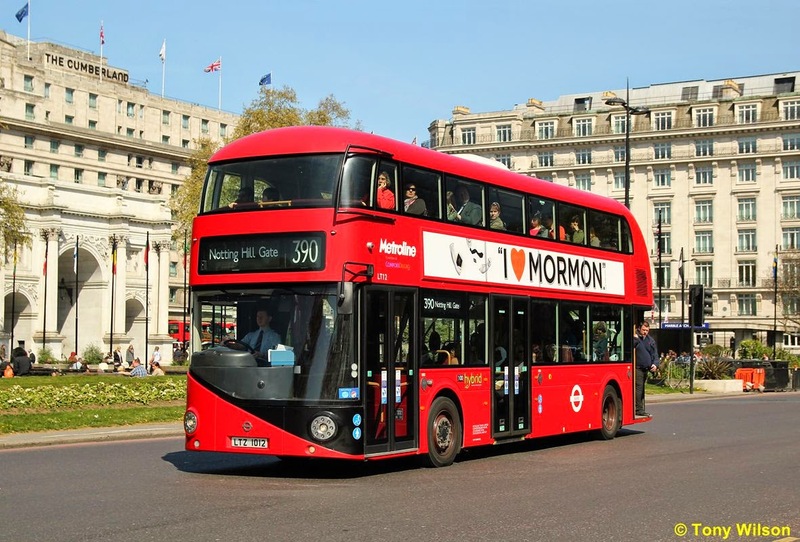 This conversion will be followed by the Stagecoach operated route 8 (Tottenham Court Road Station & Bow Church) on the 28th June. And finally. To 'round' this blog item off, a couple of NBfL images courtesy of Colin Lloyd, to illustrate the rearward curved aspects of the vehicle. The night time element of the 24 hour routes are operated by New Routemasters, not conventional buses.